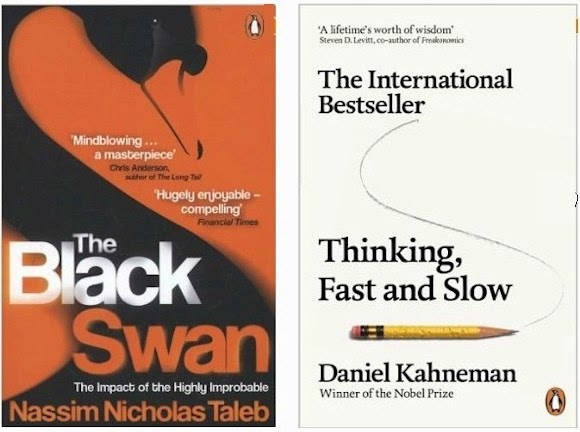 For this writer, two most interesting authors at present are Daniel Kahneman (Thinking, Fast and Slow) and Nassim Nicholas Taleb (Fooled by Randomness, The Black Swan), both of whom deal with psychology, and the psychology of trading in particular. These two writers agree on many things, and reference each other’s work quite a bit. One striking finding, which they have convinced is valid due to the scientific rigour of their methodology, is that losses are far more significant in the human psyche than are wins. An individual, and traders are no exception, will think much less of a win of a given amount than he or she will of a loss of exactly the same sum. The statistic that convinces is the one that has found that professional golfers will take far more care over a putt to save par than they will on a shot that will win them a birdie. One of the authors mentioned has calculated that this phenomenon has resulted in foregone revenues for Tiger Woods amounting to some millions of dollars over the course of his career. For those who trade Foreign Exchange (Forex), drawdowns, or trades that do not work out and which result in a lowering of the trader’s account equity, are part and parcel of the activity in which we indulge. The market participant who claims that 100% of trades result in additional profit for his or her account is either using a strategy that is so conservative that it returns less than the US Treasury bond rate, or they are being economical with the truth. Yet the fact remains that when drawdowns do occur, no one can be expected to like them. One way to deal with them is to regard them as the cost of doing business. A cost in any commercial activity, unless it gets out of hand, is not regarded as a loss. If ordinary dealing results in a surplus of profit over loss, then the trade that does not work out can be seen in this light. This is particularly the case if the trader has defined and tested a methodical strategy, found it to be effective and is confident that he or she is able to faithfully execute it on a day to day basis. Algorithmic routines, such as the OmiCronFX Mandelbrot software, assist greatly in this regard. Later this week the Bank of Japan (Thursday) and the Bank of England Monetary Policy Committee (MPC) (also Thursday) will announce their interest rate decisions. While no changes are expected, there might be indications given, particularly in the case of the BoE, of when an increase might be expected. The UK economy has been surging ahead, according to all recently released economic reports. In the USA, we will be treated to the minutes of the Federal Open Market Committee’s last meeting, on Wednesday. In the light of what was seen as a blowout result for last week’s Non-Farm payroll report, these particular minutes will be closely scrutinised by the market in order to garner possible clues about Fed intentions with regard to interest rates. Interest rate differentials are the most important determinants of currency rate movements. Employment figures, GDP change, various Purchasing Manager Indices (PMIs), fixed income (government bond) prices and all other such indicators are watched so that forecasts can be made about the movement of interest rates.